Two of Indonesia’s finest restaurants are teaming up for a special four-hands dinner with an Italian edge. Join us next week for an exciting collaboration dinner! Zibiru, Seminyak will join forces with Qunci Villas, Lombok for an exciting four-hands dinner taking place on Thursday, 6 October in Seminyak. 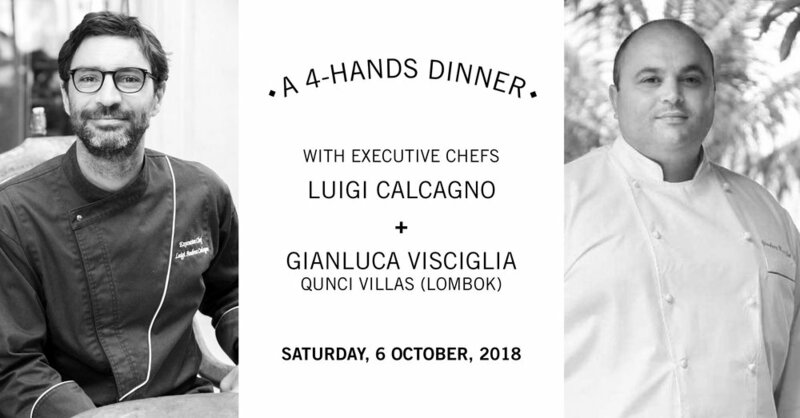 For one night only, Restaurateur-Chef Luigi Calcagno will team up with Chef Gianluca Visciglia (Qunci Villas, Lombok) for a special four-hands dinner. The duo will collaborate to treat diners to a blend of creative and contemporary dishes for one night only. This one-off menu will feature original dishes created by the two chefs specially for the event. Stay tuned to find out more about the concept and the menu for the evening. Executive Chef Visciglia Gianluca hails from Merate, a province of Lecco, Italy. His experience in Florence, Italy and Chianti helped cultivate his love and passion for cuisine from Tuscany. In the years following, Chef Gianluca worked abroad in the Philippines, Oman and Indonesia. At the Shangri-La Hotels and Resorts, he trained under the guide of Michelin-starred Chef Manuel Guemon at Italian restaurant Acqua (Shangri-La's Mactan Resort and Spa) and relaunched Rima (Shangri-La's Boracay Resort and Spa), both of which were proclaimed by Philippine Tatler as one of the best restaurants in the country. From there, in Oman, Chef Gianluca managed the culinary operations for Shangri-La Al Husn Resort & Spa and Shangri-La Barr Al Jissah Resort and Spa, collaborating constantly with Michelin-starred chefs. He has consistently garnered gold medal awards at local and international chef competitions in Asia and the Middle East. Chef Gianluca currently heads up the F&B operations for the boutique hotel Qunci Villas, Lombok, overseeing its three restaurants, Quah, Quali, and Nooq.